Instructions: Cut a piece of white cardstock 7" x 12", score at 6" along the long side and fold to create a 7" x 6" card. Cut a piece of patterned paper 7" x 6" and adhere to the top of the card. Cut the 6" x 6" panel with the cage and roses out and trim to 4 14/16" x 4 1/6" and adhere to the base of the shadow card. Cut a piece of clear cardstock 4 1/2" x 3 1/2" and adhere behind the aperture leaving it to bow out slightly in the front. Cut a piece of light green patterned paper 6" x 6" and trim each edge by 1/2" to make a 5" x 5" piece. Using the shadow box as a template cut the centre square out with the Cut Mat Create die and adhere to the front of the shadow box. Adhere the 1/2" trims to the edge of the shadow box matching the pattern of the paper. Cut three semi-circular medallions out of the Centura Pearl cardstock and adhere to the back of the box as shown. Adhere the shadow box to the front of the card. Die cut the cage die out of white cardstock and colour with the light blue 3D stamp paint. 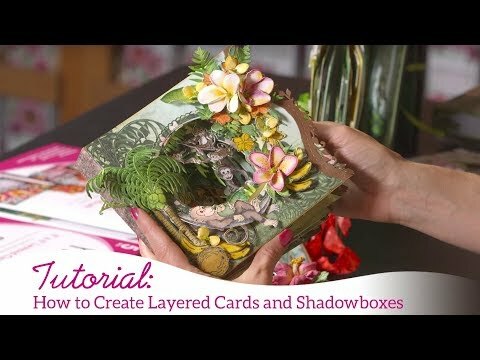 Shape lightly and adhere to the front of the shadow box card. Stamp the rose vine images from the HCPC-3753 Classic Rose Vine Stamp using Fern green and Library Green inks on iCraft cardstock. Colour with a combination of Vibrant Fuchsia for the roses and Leaf Green for the leaves and die cut with the coordinating dies. Shape and adhere to the front around the cage and down the sides. Stamp the large rose image from the HCPC-3755 Blushing Rose Stem Stamp set with Fern Green on iCraft cardstock. Colour with Vibrant Fuchsia and Fern Green and die cut with the coordinating die. Adhere to the front of the card as shown. Stamp the butterfly from the HCPC-3825 Butterfly Kisses Stamp set in Vibrant Fuchsia on white cardstock. Colour in with a combination of Buttercup and Vibrant Fuchsia inks and die cut with the coordinating die. Add Crystal Clear glitter to the butterfly with Dries Clear glue and adhere the butterfly to the front of the cage. Die cut the tags using the small tag die from the Luggage & Tag die set and adhere the tags to the top left of the shadow box with the narrow hemp twine. Stamp the butterfly image from the HCPC-3824 Fluttering Butterfly Stamp set in Manganese Blue ink on white cardstock. Colour in with a combination of Viridian and Garden Patina inks and die cut with the coordinating die. Add Crystal Clear glitter to the butterfly with Dries Clear glue and adhere the butterfly to the top left of the shadow box covering the ends of the twine for the tags.